After graduating from Portsmouth with a Maths degree, Tom left the country to work abroad for five years. Splitting his time between South Korea, where he taught English, and New Zealand, where he worked ski seasons in the winters and on a vineyard in the summers. It was that vineyard experience that sparked his interest in wine and viticulture. So, on Tom’s return to England he decided to focus on developing a career in the burgeoning UK wine industry. 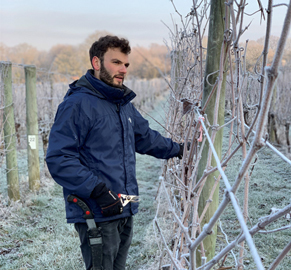 He completed the WSET’s level two award in wine and spirits and began to work in the vineyard for Nyetimber. After a year working there, Tom moved to Ridgeview in January 2019 to continue his learning. Outside of work you’ll find Tom either dreaming of mountains, in the mountains or finishing off a bottle of wine with friends.